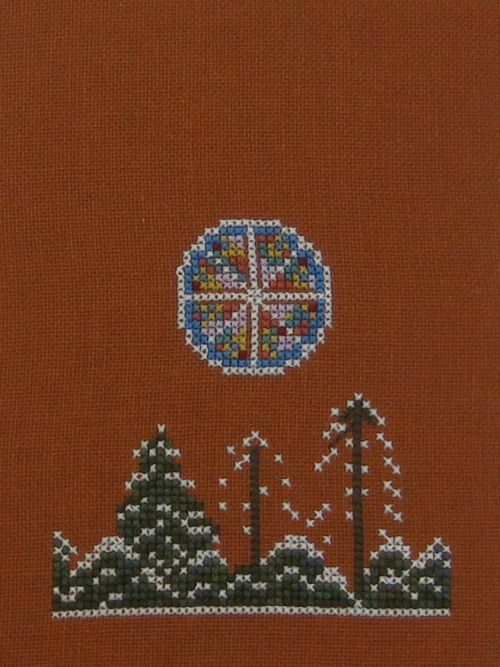 I’ve decided to start on the third of the Gingerbread Village cross stitch buildings, designed by Thea Dueck of Victoria Sampler in Canada. 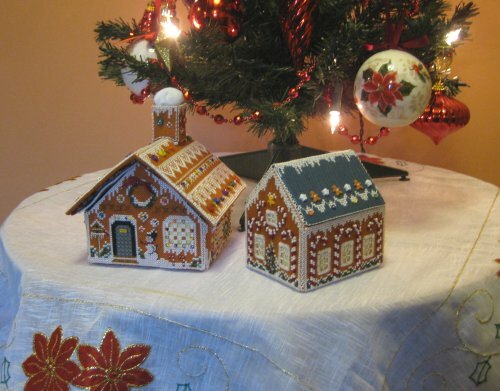 These are cute little buildings, made from the chart booklets that Thea sells – last year, I had the two I’d completed taking pride of place under my Christmas tree. This year, I want to get a third one completed in time for Christmas, to make the display look more balanced, and to give it some height. So, I’ve decided to do the Gingerbread Church, which stands about 10 inches high when finished, and has a striking black roof, so it will look quite different from the other two buildings. Eventually, I’m hoping to do virtually all of the buildings in the series, but I think I’ll need to stitch quicker, as Thea is bringing out new ones faster than I am stitching them! After stitching both of the end walls, I thought I’d ‘save time’ by stitching the two base pieces (just the outlines), so that when it came to assembly, these bits would already be finished. 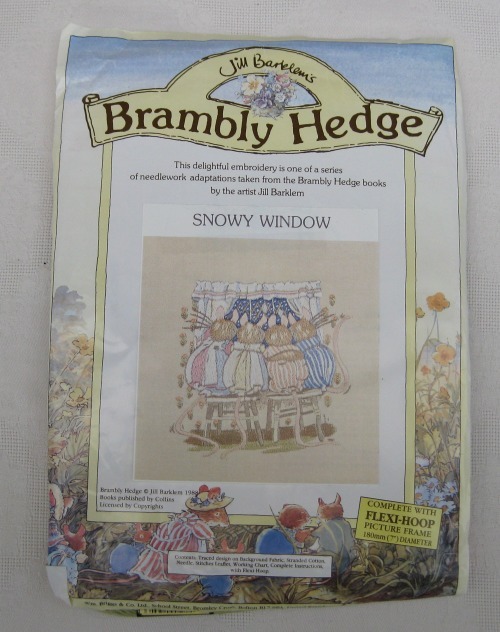 However, I found after bothering to stitch these to the dimensions given in the booklet, that the larger base piece was drawn wrongly, and was actually one stitch out on the long side….so I had to unpick it and stitch it again, so it saved me no time at all. Hopefully, later editions of the booklet will have that corrected (I bought my booklet as soon as this design was for sale, about three years ago, now). Still, that’s four pieces finished in a week, which can’t be bad! 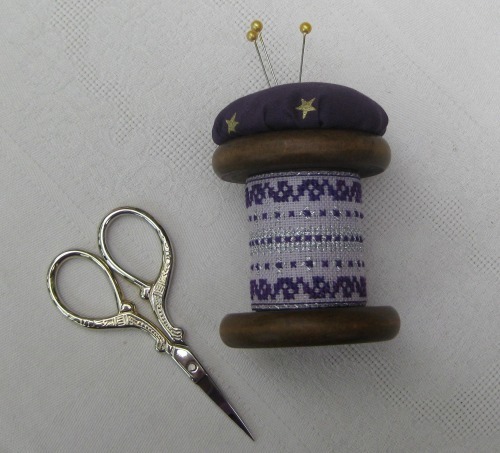 I am just completing the bobbin pincushion from the shoe etui set, designed by Chantal of Mamilou Creations in France. I bought the pattern pack as a pdf download a couple of years ago. 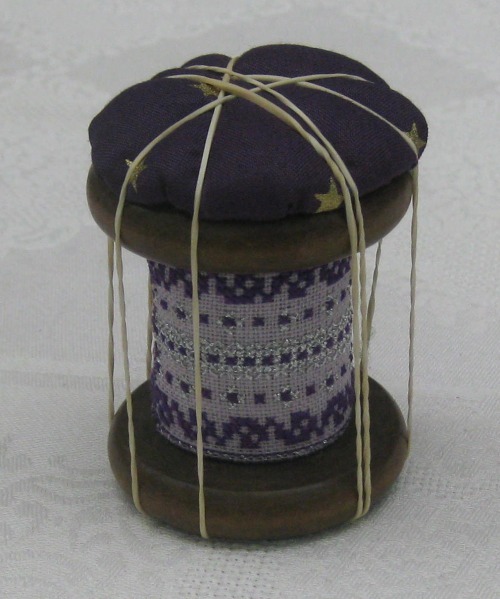 I am up to the part where I need to make the padded top, now that I have finished and attached the cross stitch embroidery itself to the spindle of the wooden bobbin. I cut a base piece for the padded top first from very stiff cardboard, just a little bit smaller than the circumference of the bobbin. I decided to use a piece of cotton quilting fabric for the top. 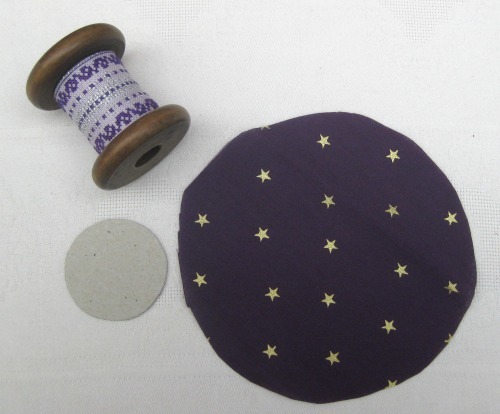 I used a saucer to roughly cut out the circle of fabric – it’s about five inches diameter. 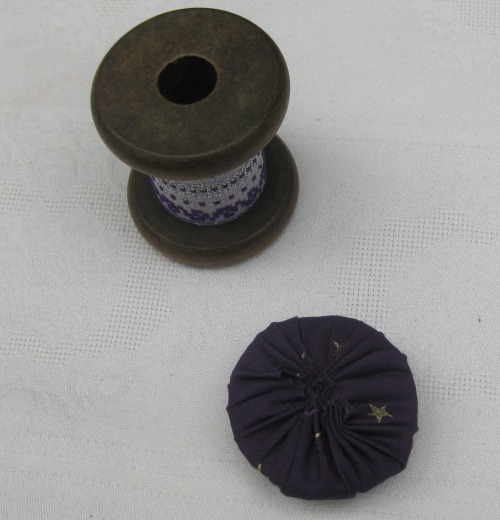 Then I stitched round the edge of the circle with large running stitches using strong quilting cotton, and pulled the thread up tightly, pushing wadding into the centre first, and laying the cardboard circle in place just before I ended the thread off with a good knot. Then I used Araldite glue to stick the padded piece to the top of the wooden bobbin. 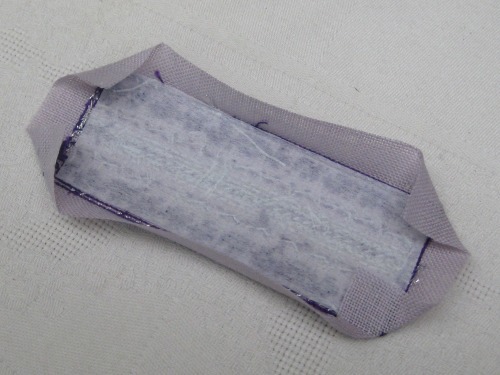 I held it tightly in place for a few hours with elastic bands, until the glue had dried. This only took just over a week of so-called ‘free time’ to make, which, for me, is a very small project. But I’m very pleased with it. 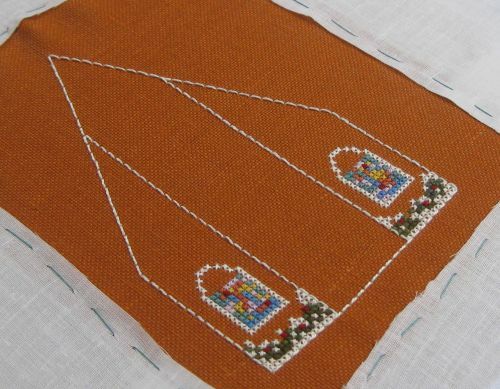 A couple of years ago, I bought a pdf chart for a beautiful cross stitch shoe etui set, from Chantal of Mamilou Creations, based in France. It’s a really innovative design, and I love it! 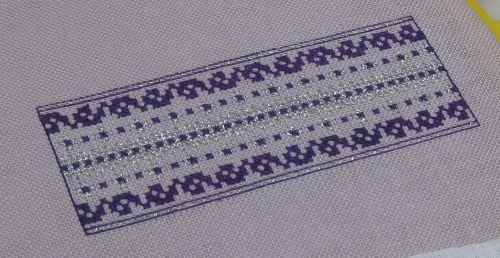 I’m stitching it on 28 count pale lilac evenweave fabric from Wichelt (bought from SewandSo in the UK). 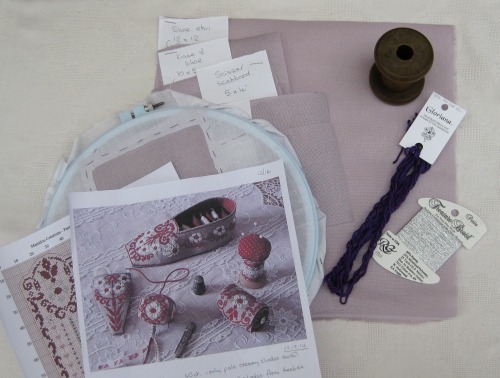 Chantal creates many beautiful etui sets in chart form for you to make (email her for details of how to buy, as her blog doesn’t sell directly to the public, but the blog has many lovely photos of her work). The wooden bobbin was bought from Etsy – there are several people selling them on there, so there’s a lot of choice of sizes – all vintage. 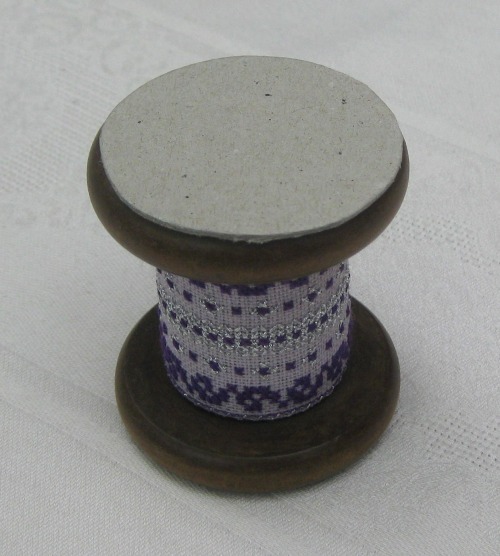 The pattern calls for a bobbin that has a spindle 4cm wide, to accommodate the design. 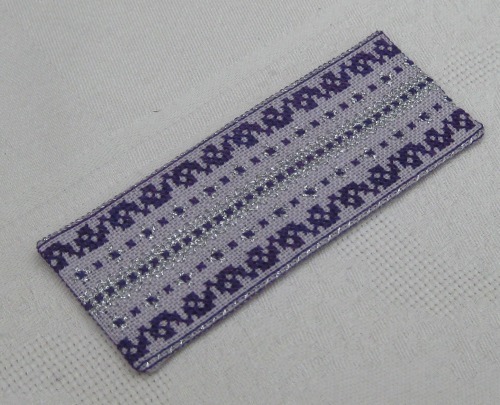 I hunted around for a while for a suitable colour scheme to stitch it in, and finally decided to stitch it in variegated deep purple/cerise, with metallic silver highlights, using Petite Treasure braid. 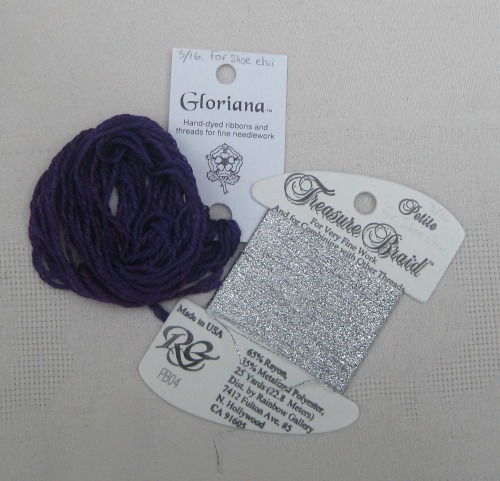 The Gloriana thread is very pretty, but I realised once I started stitching with it that the changes of colour are a bit too subtle for this project – it just looks like solid purple once stitched! 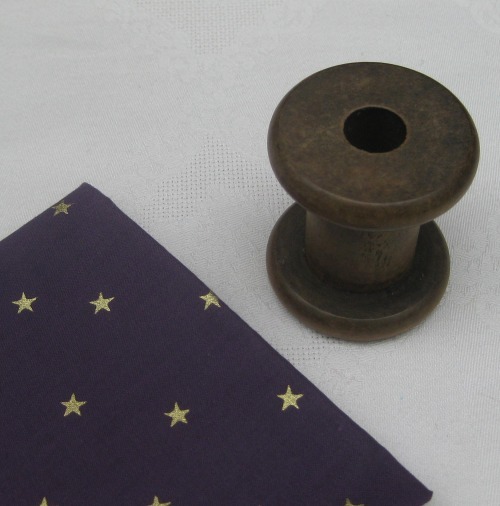 I could have used my Anchor stranded cotton stash really, and saved myself £5 for the one skein…..
I’m making the bobbin pincushion first. The design is really easy – in fact, it was a bit TOO easy for me, and I got a bit bored with the scrolly bits at the side, and kept putting it aside for something more challenging sometimes. To make the panel into a band ready to attach to the centre of the bobbin, the instructions say (in French, so I’m guessing a bit here!) 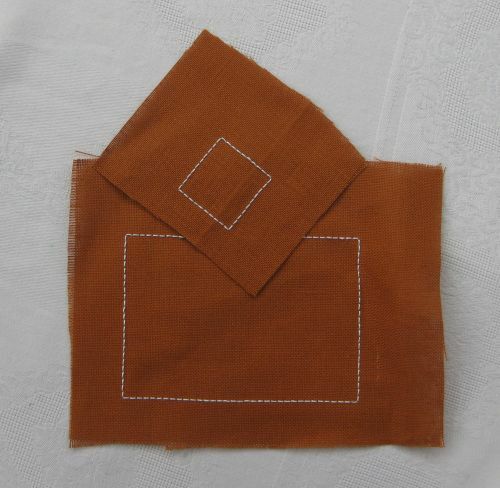 to iron a piece of interfacing to the reverse side, just inside the outer line of stitching. 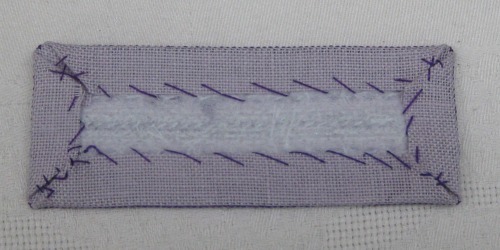 Then press the seam allowances in, right on the edges of the stitching – pressing the straight sides first, then also across the corners at 45 degrees. The seam allowances are then tacked into place (badly!! 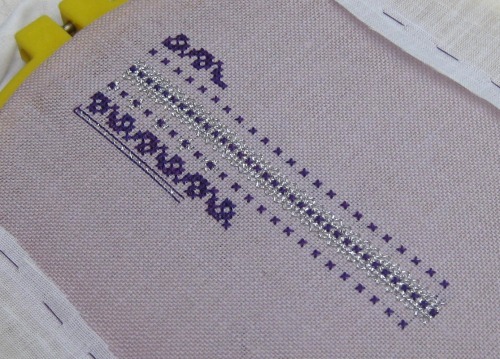 ), taking the stitches very lightly through the interfacing only. The is the panel, ready to be wrapped round the centre of the bobbin. 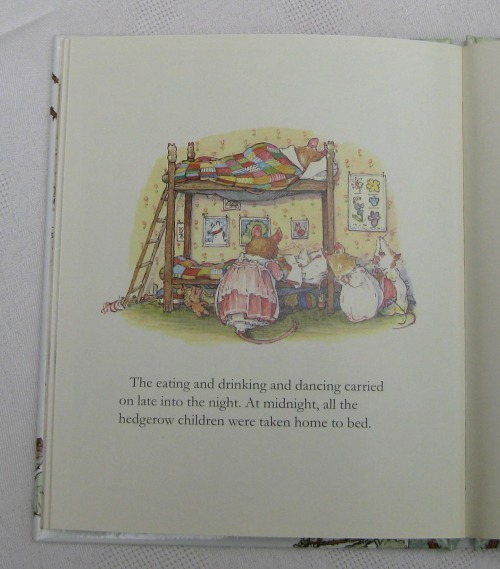 Do you remember the brambly Hedge children’s books, from the 1990’s? 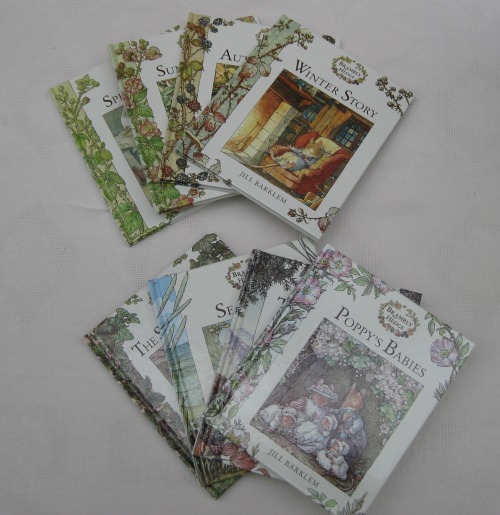 They were cute little story books, similar in style to Beatrix Potter. I used to work in a public library around the time they were originally published, and I well remember the stir they created when they were first brought out. 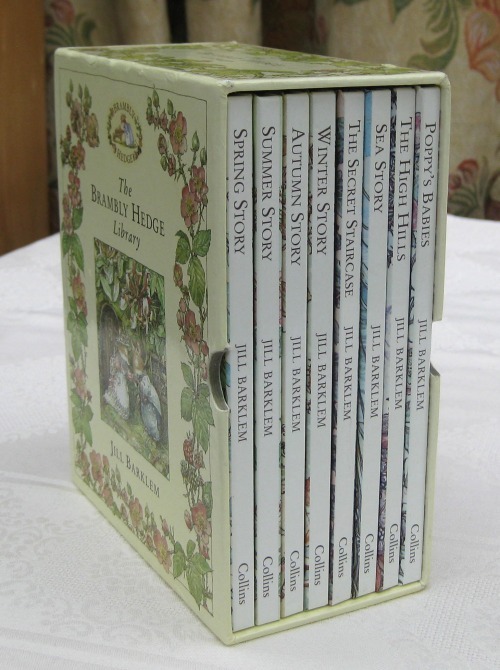 Recently, I came across a lovely full set of the eight titles in a slip case on Amazon – and it was priced at just one penny! I couldn’t believe my luck, so I bought them before anyone else beat me to it! 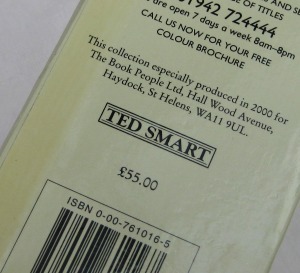 When the set arrived, I was quite shocked to see that the original price for the set of eight had been £55!!! 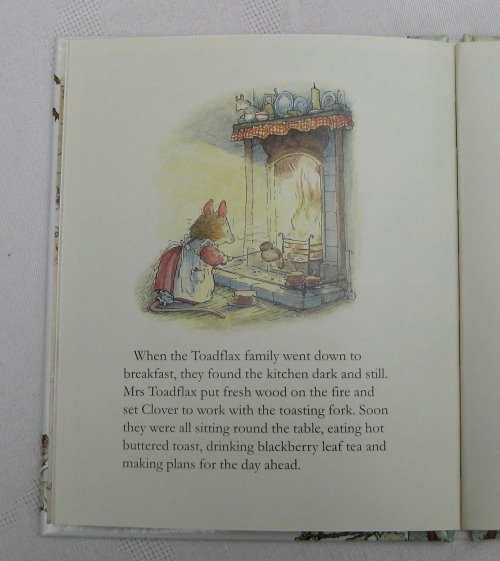 The images in these little books are just magical. They are full of detail, and really well drawn. 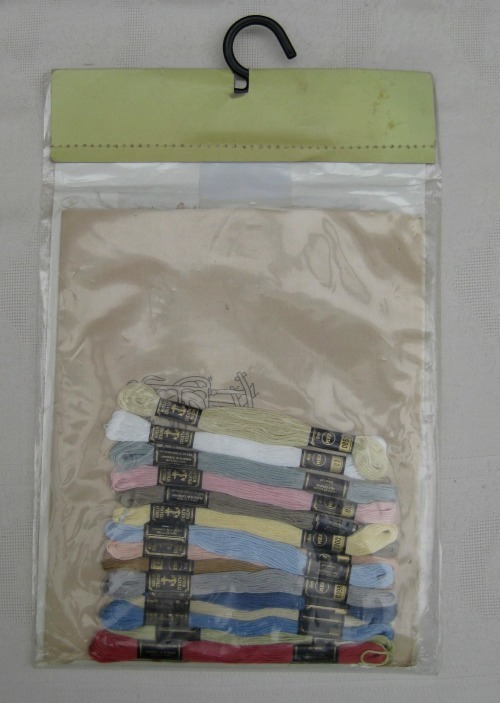 The kit has the outlines printed on a beige fabric with a slight sheen to it, Anchor full skeins of thread, a key to the stitches, and even a flexi-hoop. 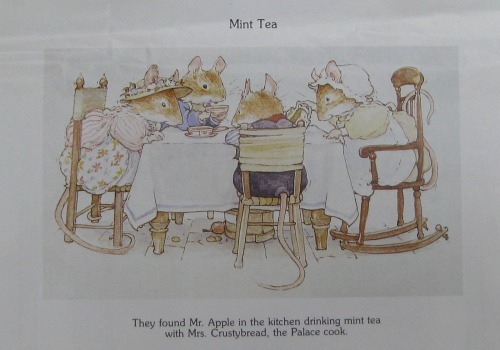 The other design is of several mice sitting round a table drinking mint tea. 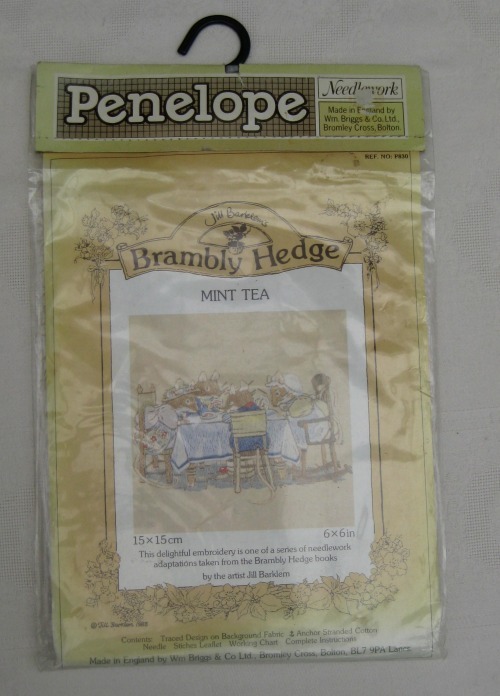 This one didn’t have a flexi-hoop in the kit, strangely, but the rest of the contents are similar. I think I’ll get a flexi-hoop to match the first one, so that I can display them together. 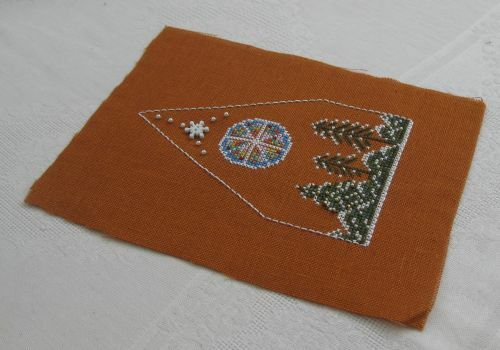 The embroideries are very well designed – similar to the pictures from the books, despite using only about half a dozen stitches (mainly stem stitch and satin stitch). 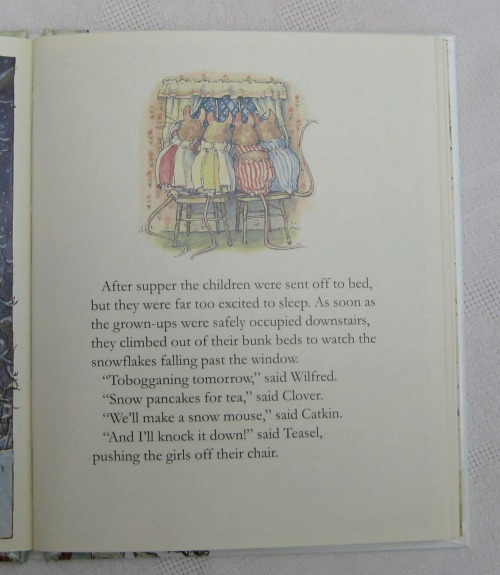 The colours have been deliberately kept muted, like the watercolours from the books. 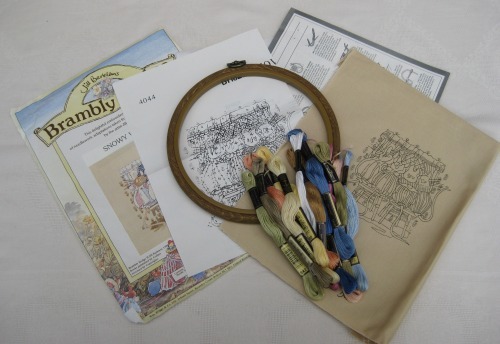 The instructions that you actually stitch from can seem a bit daunting at first sight, but anyone who stitched surface embroidery kits in the eighties and nineties will be familiar with this – a really detailed image, with each line having a different pattern, so that you can refer from it to the key, which tells you which stitch you should do, in which colour. It’s like painting by numbers, but with thread. It’s easier to do than to explain, really!